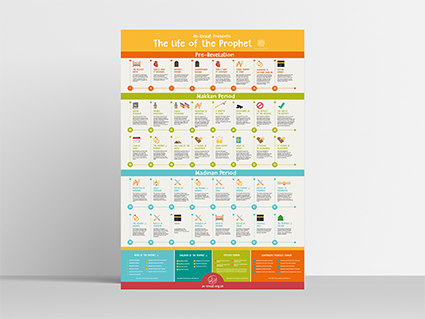 This A2 interactive poster is a comprehensive timeline of the life of the Final Prophet, the Messenger of Allah split into pre-revelation, the Makkan period and the Madinan period. Each year of his blessed life, is expanded on with details of main occurrences. Specifically chosen images to suit the events in each year were designed as a learning aid in helping children memorise the life of the Best of Creation. Details of the family of the Prophet, virtuous women, ten companions promised heaven can also be found.